A model for crowdplacemaking is… in Vegas? First of all, to dispel any myths, this has nothing to do with the casinos or the famous Las Vegas Strip with pyramids and Eiffel Towers – that’s not even in the City of Vegas. This is about revitalizing the historic downtown core for people who prioritize entrepreneurship and creativity over gambling and pirate shows. Where is that $350 million going? That’s $100 million in residential development, $100 million in commercial development, $50 million in small businesses, $50 million in education, and $50 million in tech startups. Where is the first tangible investment you can experience? 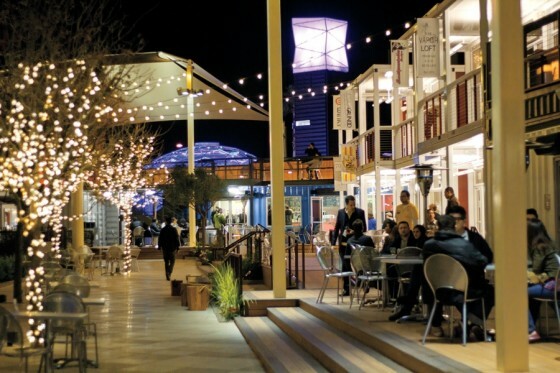 That would be the Downtown Container Park (see video below), a pop-up downtown that was built in a few months, but is already serving as the face-to-face social networking portal for downtown Vegas. It has 34 restaurants, bars and shops, and one of its most appreciated traits by locals is the hours, where the retail outlets are open Sunday through Thursday, to 9 pm; Friday and Saturday to 11 pm, and the bars and restaurants close at 11 pm Sunday through Thursday, 1 am on Friday and Saturday. That’s priceless for those who live near a downtown that shuts down before the evening is even getting going. What do people think of it? See “We Can’t Contain Our Love for the Downtown Container Park“. The best part from an investment point of view? Construction started in February 2013 and it opened in November. Instant downtown. Instant returns. What’s impressive is that all of this is going on before any real estate development is happening, after which people will benefit from inspired placemaking as well. What’s exciting is that communities may have the chance to gain assistance with initiating their own Downtown Project. Stay tuned at @cspmgroup.